With all the aspects of a real wood floor, but without any other restrictions, real wood engineered flooring is a practical design choice for any home. Choose from five depth of products available in a variety of real wood finishes. 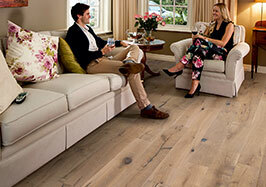 When laid, an Elka Real wood engineered floor is virtually indistinguishable from a solid wood floor. This is thanks to the product's unique structure, which includes a generous surface layer of between 2.2 mm and 6 mm of real wood, making it possible for all engineered floors to be sanded and refinished. The strength of each board comes from three or more layers of wood laid in opposite directions. This helps to avoid any issues with contraction or expansion, making it perfect for use in areas where traditional hardwood flooring cannot be used, such as in all conservatories or in conjunction with embedded underfloor heating. The simplicity of its construction makes it perfect for use in DIY projects and thanks to its strength, it can easily be installed as a floating floor. 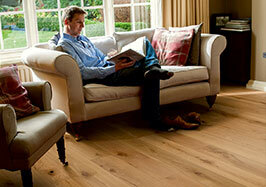 We have introduced more UV oiled wood floors into engineered range. Advances in UV cure technology have resulted in a finish that is more versatile, hard wearing and easy to maintain whilst retaining that natural aesthetic of wood. Oiled wood floors require an intermittent maintenance program. Cleaning the floor with Elka clean and applying a coat of Elka protect oil at least once a year won't just remove scuffs and scratches, but will improve its durability and it will also restore your floor to the vibrant piece of nature you fell in love with first time round.